Bring a sophisticated polish to your closet with these Botondi Milano suits. Made with refined Italian style in mind, look out for expert tailoring alongside vintage-inspired details and an eye-catching palette. Expect luxe materials like silk crafted in sleek silhouettes and enhanced with striking prints. 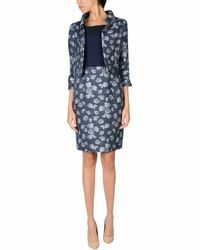 These Botondi Milano suits have tops and jackets with defined waistlines for a feminine feel and flattering skirts in knee-length styles.